With Andy Murray winning the tournament at Queen’s on saturday and Wimbledon looming this will be the first year since 1998 that I am not working at the Wimbledon tournament. So I really want to say good luck to all my friends and former colleagues for the forthcoming madness that keeps the Wimbledon web and media presence going. It seemed a good time to do a collection piece on Wimbledon. Though as I seem to keep getting incorrect copyright takedowns from some of the media companies who knows how long the media will stay in place. Working at Wimbledon has been a very formative experience and I don’t want to repeat what I have written over the years on eightbar (of which there is a great deal), however it should be noted that it is one of the oddest and most high pressure jobs I have done in my career. The responsibility we all feel as a team towards the club, to the event and to one another is something that I will not ever forget. A rare mix of emotions as a fanployee. The most unusual aspect of the event is the mixture of heads down pressure work to keep things ticking, intense periods of potential boredom when it’s all running smoothly, incredibly inventive moments when someone says “hey what if?”, fatigue and a sort of jet lag caused by early starts and late nights with play starting at midday, adrenalin highs from presenting to visiting customers, press and dignitaries and the actual customer as a partner in all this. Many more work environments could benefit from this sort of fanployee feeling and atmosphere! I think it is safe to say that most people what work at Wimbledon in some capacity from IBM really do care deeply about the outcome of the project. That passion and willingness to make it all the best it can be also generates some envy and jealousy from those that don’t get that opportunity or who if they did may not cope. I have on a number of occasions had line managers suggest that working at Wimbledon is some sort of award. I can see the point of view, but that always shows a lack of understanding that only comes from actually having been there and coped with the highs and lows. Wimbledon has been very good to me experience wise though. It was both technically challenging, but also brought mental toughness and the ability to present to people and be passionate about that presentation at a moments notice. (As clients just appear in the bunker office on the main tour and usually need entertaining). It was Wimbledon that started me blogging inside the company firewall, telling the behind the scenes tale that no one otherwise got to here and of course that inevitably led to my push in Second Life (yes all this will be in the book thats slowly getting constructed). I also can’t take credit for this (or can I?) but this is the first year that Wimbledon has been licenced properly into a video game of any note. 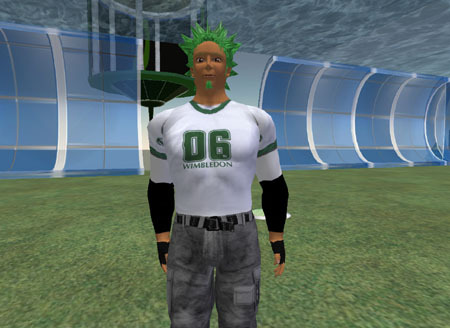 For now though here are the 3 rough videos from 2006,2007 and 2008 of the Wimbledon Second Life build. Wimbledon Second Life back in 2007 from epredator on Vimeo. This is really the post that started it all off so you can see what I was thinking. IBM, amongst other things, runs the official Wimbledon website during the event. 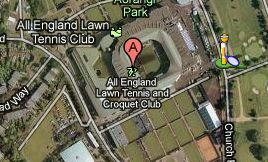 This has lots of exciting well designed tennis information, real time scores and we deal with a large volume of traffic. Most years I am onsite for a period of time, helping explain how we bring innovation to our customer as part of a large cross IBM team. 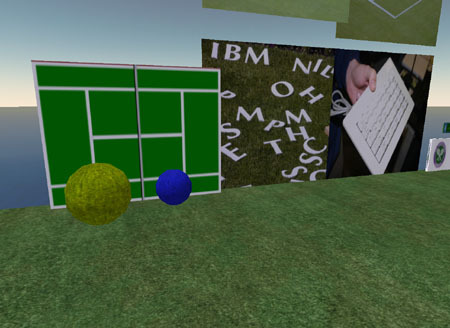 In the lead up to the event, and with what I know about the data we have, I decided to take on a mini proof of concept to bring Wimbledon to Second Life. The first point is that this is a proof of concept. The build is designed to show the various ideas rather than be a 1:1 representation of the actual place. That’s very possible, but would take more days to build. Secondly, lots of people could attend, the shots show only one avatar. The example security gate is there to show you can detect things about peoples avatars in this case it shows the name and if they are wearng anything that contains code. Next is the highlight. 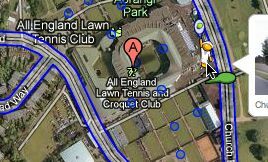 The real world tracking data for actual tennis matches. We get a feed for the normal web scoreboard and the point tracker. Here we plot the ball in 3d space and can rotate around it for various angles. The net is actually in control, if it gets told another url to use it plays another rally. This can be done manually, by talking to it, or by another control box that cycles through the various games. We could put players on this, with the extra data we have on which shot has been played and knowing when the ball changes direction, but I was working to a timeframe. This shows several concepts. The main one is the 2 spheres, these are ambient devices that change size depending on who is winning the match, it shows the ambient device concept. The picture on the right is of the IBM special keyboard used to record the matches, with keys for forehand smash, volley etc. This shows one of the special products at work. The flying wimbledon towel. When anyone clicks the towel it act like a normal banner ad and directs them to the real wimbledon shop for the real towel. This banner add though can be flown as a vehicle. So I can fly around, advertising in places without leaving the ad lying around on private property. Avatar based marketing. 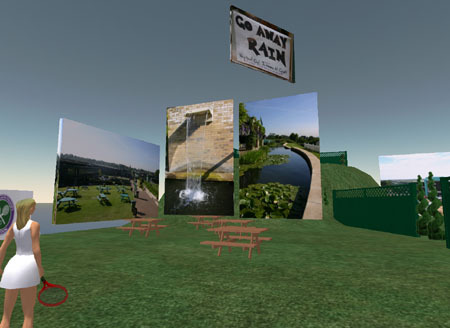 These images show a mixture of photo panels of things at Wimbledon and 3d objects such as the park benches. Just to add a bit of character. The go away rain sign is a legacy of many championships. Whilst the trigger for the video is standing in front of a particular one (and hitting the movie play button in SL) the video will play on all the screens at once. It does not have to do this, I just liked the effect. This is sort of Henman hill. Again to show a hint and nod to the real place. The video wall in this case is showing one of last years flash scoreboards, to show the analogy with the full size court and the previous web incarnations for tracking the ball. Again this is a flavour of mixing 2d pictures with 3d objects the line of benches coming out of the space, giving depth. These pictures show an object raining multiple tennis balls down. No real reason its just fun, It actually the same code as the full court but the balls are physical, and hence fall rather than the one on the court demo that hang around, to help show the path of the ball. The chat history window shows us what Fred said, and formats its nicely. Further up in the air, to use the small real estate, is a hovering Wimbledon shop. The products in the shop include a Tshirt, using the actual tshirt as source to build a SL Tshirt that can be worn (see last photo). This shows the flow of money and product placement. We also have some pose balls. These allow us to put an avatar in a pose when they are attached to it. In this case two backdrops with different poses. 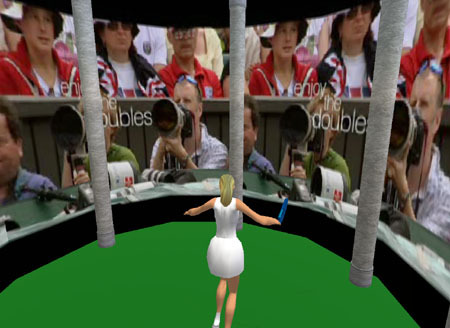 People then are able to take snapshots of them ‘in action’ like in new citizens plaza, but tennis branded. The avatar I am wearing is available for sale from a poster of the avatar. Again shows the flow of money and the potential to look like real people. We have a pagoda in the sky, its also a video wall showing one of the IBM vignette adverts. So you can fly in and be immersed in the video. And there we have it. Back to a normal(ish) look, but wearing my Wimbledon 06 tshirt. For more on what IBM does at Wimbledon it really is a fantastic effort and a great partnership. That is just the start of IBMers in the Metaverse. Anyway good luck everyone, and I look forward to actually getting to watch it this year ! Come on Murray !